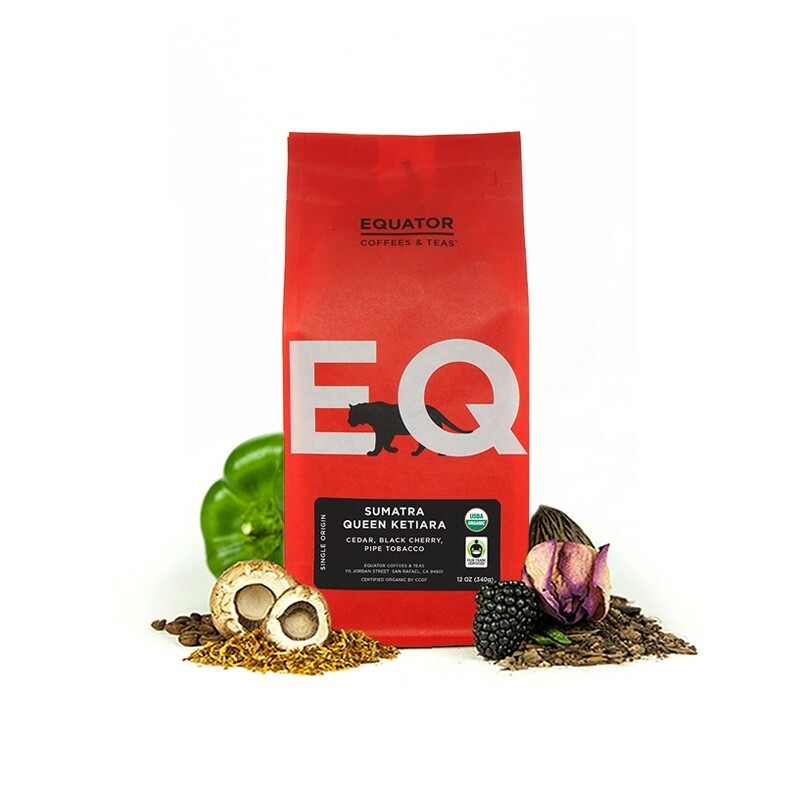 The Sumatra Queen Ketiara Fair Trade Organic was carefully roasted for you by Equator Coffees & Teas. This semi-washed coffee was grown in the Aceh Highlands region of Sumatra. This triple-picked organic coffee from Sumatra has a bit of deep fruitiness that shines through the heavy-toned, earthy base - we taste notes of teak, cedar, pipe tobacco and black cherry in the cup. Excellent coffee in both my typical brew methods (pour-over and French press) with a fantastic balance between rich, dark stonefruit flavors and earthy notes. I get a decent chocolate undertone that I really enjoy. not my favorite. I may be a bit of a light roast snob at this point, but i like fruity and flavorful coffees. The one thing about this coffee that i can appreciate is that it will wake you up in a hurry. The caffeine content in this coffee is insane. I liked the Equator. It was very easy to drink and I prefer black coffee so I enjoyed the taste. It seemed slightly light-roasted which is different for me because I mostly drink medium-roast. I enjoyed it though! This coffee is great! I️ really enjoy all the flavors and it has a great smooth finish. A good cup to have in the morning. The acidity we enjoy is on point in this cup. We're not big on tobacco notes, but the rest is fairly nice. Great cup of coffee. I enjoyed this coffee a lot. I enjoyed how bold it was, yet very balanced. It had a very smooth earthy finish. Would definitely buy this coffee again. One of the best ones we've had in quite some time in both chemex and drip. This is definitely one of my favorites so far, it is indeed earthy, full bodied, and fruity(blackberry), with a hint of bakers chocolate. Maybe the best coffee I've tried yet. Hard to pick out specific flavors but the coffee seems to be very well balanced. I like this coffee quite a bit. It's quite robust and really smells great. I'd definitely like to try more in this kind of direction. Thumbs up for a cold beverage. Thumbs down for a hot beverage. A bit darker than I generally drink but does have a rich and complex flavor with dark berries and warm spices coming through. Definitely full bodied! Not a big fan of this one. It tastes kind of dull to me, not really earthy, but maybe that's what I'm reacting to. well roasted coffee. The earthy taste is not overpowering and the fruit is not to acidic. I feel like this coffee has potential, but I had a hard time extracting it properly. It took me long time to dial-in a good way to prepare this coffee, and it was very finicky. The coffee was quite acidic, full-bodied and strong, and was roasted darker than I would typically prefer. I usually go for more fruity and light coffees, but this is overall a pretty decent coffee if you don't mind the acidity and strong earthy tones. A really great, aromatic and full bodied cup of coffee. Delicious! I like that it's on the full bodied side. It's a bit acidic but I like it. This is probably the top range of my acidity tolerance. love this one. it tastes great no matter how I prepare it and isn't acidic. nice earthy taste. didn't really pick up on the fruity notes though. now that it's getting warmer out, I'm interested to see how each coffee tastes as a french press cold brew, which I haven't tried yet. my one negative comment is that this does not seem as full bodied as it states. definitely could not hold back a little on the bean to water ratio like I normally prefer to. Generally speaking, I'm not a fan of Sumatra coffees. This was no exception. I would give it a 3 1/2 if it allowed me.. This one is much better, more to my liking and we like the fact that it is organic. It starts out very nice but the final taste is a bit lacking if that makes sense. If we could find one that has the rich earthly taste all the way through it would be perfect. This is a consistently delicious coffee with strong woody flavors, though I didn't get any of the cherry described in the tasting notes. I would definitely drink this again. This is a wonderful coffee. I would be excited to receive more coffees with a flavor profile that centers around this. Really love this coffee. Very easy to drink and tasted sweet and bright with no sugar added. Is something I could see myself brewing every day. Great nuttiness. smooth brew in the french press. did not notice the fruity acidity as much as the description shows. I like the earthiness of the coffee but perhaps a *tiny* bit on the dark side of roasts. I think something right between this and the kickapoo would be right in the sweet spot. Coffee was fresh - received 3 days from roast date. You could tell from the chemex bloom that it was recently roasted. The first time I brewed it, I followed the instructions on the tag - boiling water and ~14g water/ratio. It was way too acidic for my tastes. I do not like Sumatran coffee, as stated in my initial statement to Mistobox when I signed up, for that very reason. To adjust, I made a second cup of coffee changing the water temperature (down to ~185F) and increased the water ratio to 16g water/coffee. This was a much more drinkable cup of coffee and i started to taste the strong woody/earthy flavor I've come to expect from Sumatran coffee. Increasing the ratio to 18g water/coffee has resulted in a reduction of the woody/earthy flavor. The coffee is pretty good for someone who likes a woody/earthy flavor; I just don't like tasting sticks with my coffee. There was no fruity flavor (which may be because the acid was too much in the first cup and was fairly neutralized when I reduced the water temp). this was OK... it has an earthy flavor but not much else - the other notes are probably too subtle for my palate. I really enjoyed this one! I loved the bright fruity acidity and at the same time there were darker more complex notes present as well. I enjoyed that it wasnt overly bitter as I am used to tasting when drinking sumatra, in fact, I am usually not a huge fan of Sumatra but I have to say that this Sumatra Gayo really surprised me! A coffee with a nose of cocoa powder, and upon first sips a deep and complex balance of of earth and cinnamon with a full feel on the mouth. I think this is delicious. To me it tastes smooth, juicy, and just a little "chewy", but not bitter. Great flavors, really liking the freshness of the coffee(roasted 2 days before I received it, hard to get much better than that), it was a roasted a little darker than I usually prefer though. No bitterness. Overall great coffee though! Too dark for our taste. Tastes bitter, almost like a French Roast. This was great, we both really liked the flavor. I thought it cooled really nicely...I was discovering new delicious flavors right down to room temperature. I liked the earthy smokiness of this one a lot. It was solid taken black or with a touch of cream and sugar. Definitely a winner. This is one of my favorite coffees! Really nice and comforting, not as dark as I would like but still one of the best ones out there! This coffee was delicious with light floral acidity at the back. However, I had to use more than the usual amount of beans for one cup. It also tasted better done in the old fashion boiling and filtering method. This coffee looks, smells, and tastes burnt. It's going into the bin I save for people who prefer Starbucks. I think I've discovered that I don't like fruity coffee. It always has kind of a sour after taste that I do not like. A little too blod for me. It tastes like a dark roast. I like a darker roast with a bolder taste. Better than other Sumatras I've had in the past, still, a very finnicky bean, prone to tasting like dirt if the brew is even slightly off. Delicious! I love Indonesian coffee and this was a lovely roast on a full bodied, herbal Sumatran. Pretty good. Not bold enough though. Absolutely love it, very aromatic, distinctive and delicious! Not a fan. I know that Indonesian coffees are often dark-roasted, but this was just too dark for me. That said, I am eager to keep exploring Indonesian coffees. Darker side of medium roasted coffee, with good flavor. Not so much fruity, but rich depth. I agree with the previous post on finding the right ratio of beans to water in a French Press - don't skimp on the amount of beans. Nice light roast, but still a bit "dark" in the brew. I used the 26g coffee to 400g water with the Hario as recommended...I may try a bit more water tomorrow. Very dark roast, so much so that I'm having trouble getting a cup of coffee that isn't overwhelming. And don't get me wrong, I love a strong cup of coffee and this is a *great* problem to have. It's taking some experimenting with the brewing process, but I'm working on it and will update this if I can get it right. packs a delicious coffee punch. The perfect Saturday morning mug! Big, full-bodied coffee. Taste is very earthy, with just enough acidity to keep it from being "muddy". A bit of fruit right in the beginning, with the cedar taste coming slightly after. Too dark for me. I prepared in Chemex using roaster instructions and it still tasted over powering and burnt. I don't like Sumatrans or anything Indonesian. My favorites are African Coffees. To my palate, smooth, rich and satisfying. I get that cedar-like taste, faintly – even a sense of the dark cherry. Vaguely like a luscious Malbec. Although that’s wine. And this is coffee. Seemed very dried out when grinded. Didn't love as much as the first one. Full-body, and bright finish. Delicious. I enjoyed this coffee, but it was a little too...dark? for me. A little too think and full, I think I prefer something a little lighter. I'm not sure I'm describing it correctly. But I did enjoy it very much and I look forward to trying the next order when it arrives. I was not a huge fan of the amount of acidity in this coffee. I prefer a more balanced coffee. Had to put a tad of cream in this one to balance it out. Good, but roasted slightly darker than I typically like. Because of the deep roast, it paired well with a splash of milk. This particular roast is a bit to dark for my taste. I've had other roasts from this toaster before that I've enjoyed, so I think it's just this particular roast that I didn't like. This is a highly satisfying and enjoyable coffee if not just a bit tempermental. The aroma was amazing, the most enticing of all the coffees I have received. The flavor, when brewed with the right ratio of beans to water or in a method other than drip, was fantastic and right on with the description. This is a full bodied coffee that had a lot of depth to the flavor when brewed correctly. This coffee, however, took a few tries to get right. Slightly too little beans or brewed in my drip machine created an acrid, burned finished that was not enjoyable, but when I found the right ratio and used french press or pour over, the results were great. Now that I have found the trick to brewing these beans, I would definitely buy again.